Meet the new Little Bigfoot Elephant! For those of you following this blog you know that I am going through each of my Little Bigfoot original designs from 2012 and updating each pattern. Elephant, bear and pig done and then I can do a before and after picture! ears, a new head shape, a new trunk and new tail. And those of you who have made all the older patterns from 2012 you know that all the heads and bodies were the exact same but this time around each animal I've redesigned so far has a different head shape from the next giving each one some individuality and their own personality. I'm enjoying this 2014 series so much and I hope you are too! 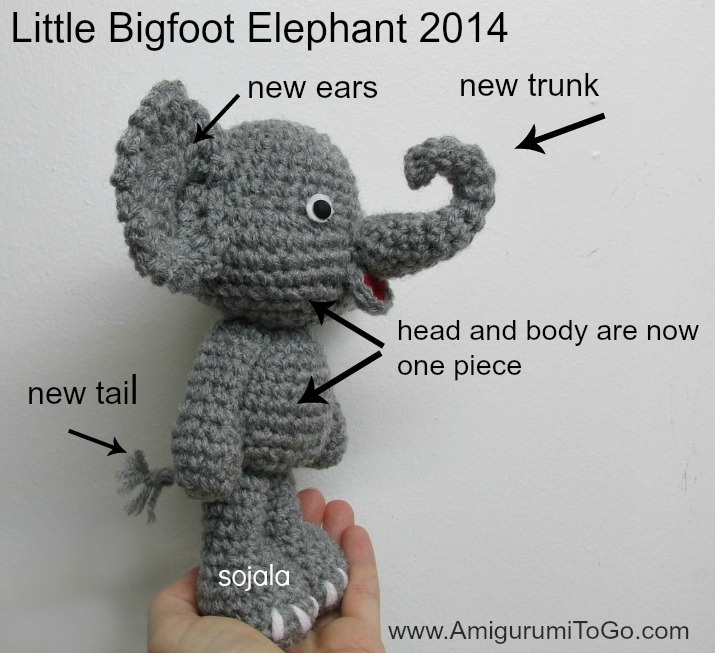 Tomorrow I start filming the Little Bigfoot Elephant tutorial. It takes about a week or so to film and edit these videos so check back soon. Text and images contained inside this post are not authorized to be sold as a cross stitch pattern nor shared in full or in part on any cross stitch site nor on any DIY site nor on any website. This does not exclude sites or members of sites posting copyrighted material under the guise of educational purposes. Text and images contained within this post are not authorized to be traded, given, received or sold for points, gold coins or for any other form of monetary value. Text and images contained within this post are not authorized to be placed in full or in part on any website, book, magazine, page or forum. 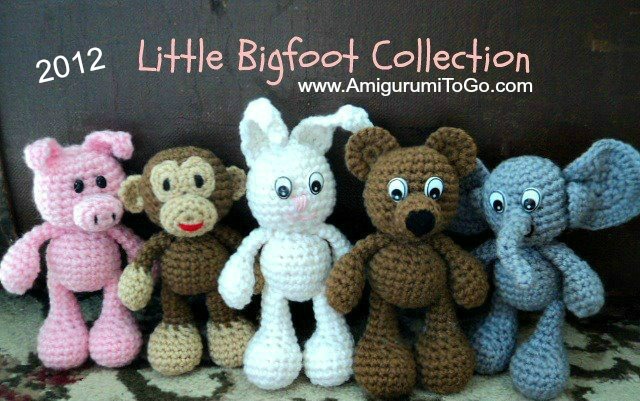 I am a new follower and half way through my Little Bigfoot Bunny which I am loving. 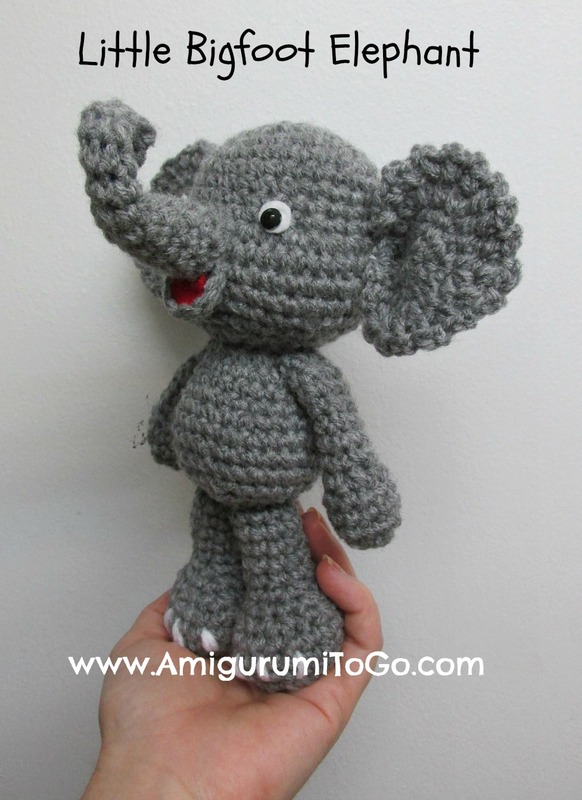 Now I have seen this one is on the way I can't wait to have a go at that one too…..I might make mine in to a pink elephant just to be different! These are sooo cute! Thank you so much! My new granddaughter will love them! I loved this cute little pattern. It was very easy to understand. I was going to make a donation but thought that instead, I would buy some of your patterns. Do you have any to sell or are all of them free?